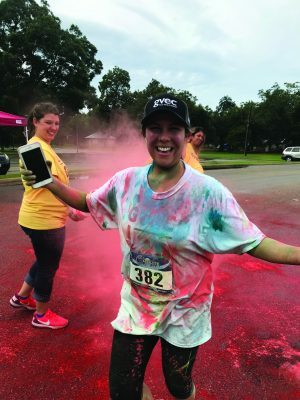 Whether they ran or walked, participants in September’s GVEC Gives Back 5K event ended the course in a blaze of color. 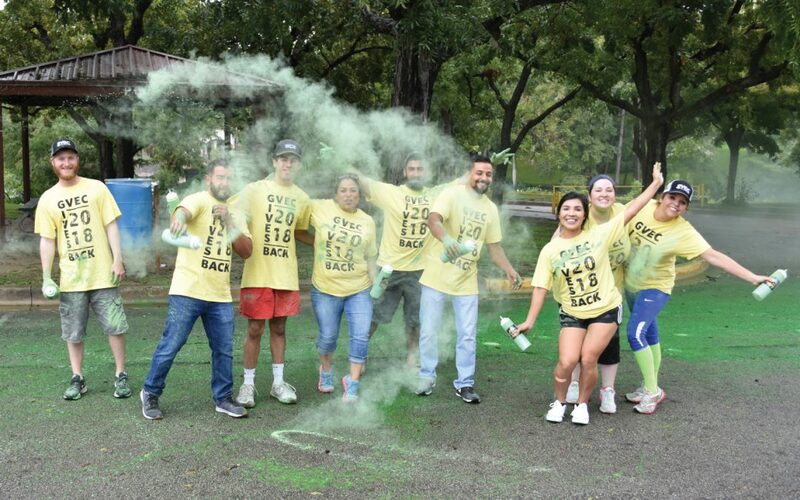 Their T-shirts were plain white at the start, but ended the race saturated in powdery swaths of blue, green, red and yellow, along with a kaleidoscope of mixtures. The 5K Color Fun Run/Walk, which started at 9 a.m., took participants alongside the Guadalupe River, delivering a magnificent view. The course included four “color stations,” where event volunteers “dusted” runners and walkers from bottles filled with colored powder. Participants passed each color station twice, allowing no one to escape a thorough dusting. Most volunteers finished the event layered in blue, green, red or yellow themselves, depending on the color of the station they worked. 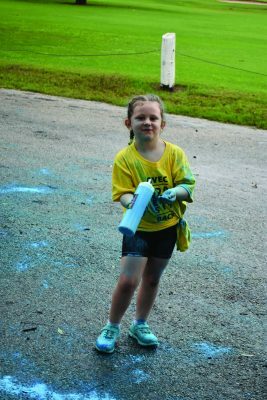 Event Coordinator and GVEC Human Resources Specialist Megan Zella, herself coated in “Color Fun Run” dust, categorized the day as a success. Zella praised the overall level of event participation, calling it a great example of how the community is always ready to help one another even when there’s not an immediate emergency or other urgent need. 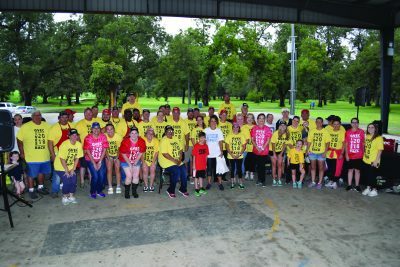 Between event volunteers, those who took part in the run/walk, or who bought lunch or raffle tickets, about 200 participants contributed time, money and other resources to the event. Over 90 people signed up for the 5K and 160 BBQ plates were sold. The event raffle, featuring 38 donated items, raised nearly $3,400. All totaled, Zella reported, GVEC Gives Back raised just over $23,000, 100 percent of which will be split between donations to the Guadalupe County Children’s Advocacy Center, Seguin, Texas and Norma’s House (Gonzales Regional Children’s Advocacy Center), Gonzales, Texas.